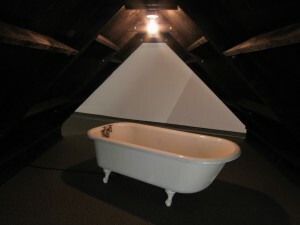 In-Between is an installation made up of structures reminiscent of the liminal spaces found in a house (the attic, the space under the stairs, and the corridor). Each structure contains psychological implications that manifest in objects charged with signs of the past. The relationship between objects and spaces shape the work, contributing to a narrative that suggests past existences. Video and sound components are used to bring the objects to life through the viewer’s imagination. The body of the viewer is displaced, disjointed, and extended as it passes through the space of the gallery and the physical and virtual spaces of the art work. Each structure contains psychological implications that manifest in objects charged with signs of the past. 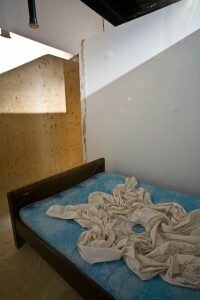 The relationship between objects and spaces shape the work, contributing to a narrative that suggests past existences. Each space has the potential to activate all sensory faculties creating stronger associations to memory. In The Attic space, the charred ceiling emits the scent of burnt wood. The contrasting white porcelain tub is fit with speaker pads that cause the tub to act as a speaker itself resonating an electro-acoustic sound scape. Domestic objects are forms made for the body, and the body reconfigures itself to relate to these structures and the space around it. In my work the domestc objects and spaces become claustrophobic, forcing the body to reform to the convention of domesticity. 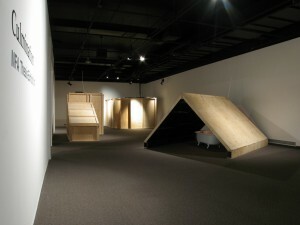 The body strains to fit into these objects and spaces physically, emotionally and psychologically. The semblance of the body is further altered when subjected to a technological function. 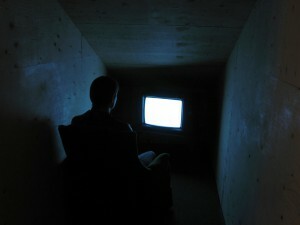 In The Space Under the Stairs – when the viewer sits in the chair; the white noise of the television is replaced by the delayed image of the viewer. 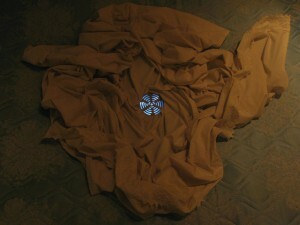 This image is played in reverse, further displacing and fragmenting the body. 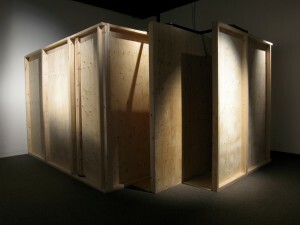 The body is transformed into a ghost like image of the viewer watching themselves recede into the background of the structure. 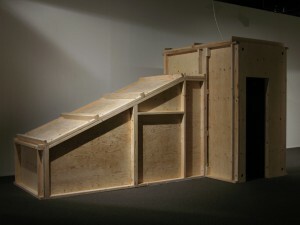 The image on the screen is a likeness of the former self; it is the image that haunts the space under the stairs as it is mirrored in virtual space. In The Corridore a video camera hidden in an overhanging pipe takes the image of the viewer and places it inside the drain in the bed. The drain becomes both an entrance and a barrier, as the body of the viewer is reduced to a distorted image of hair and flesh. In the work, the viewer becomes fragmented and reconstructed through their relationship to domestic structures, and technology – performing in multiple roles and bringing the spaces to life with their presence.